Raja asks Raaj Guru if it was an accident or a plan of Vishkanya. Raaj Guru says it seems it’s the plan of Chabeeli. Her soul is in the palace, but he couldn’t find out where she exactly but she hasn’t attempted to harm Viraj or meet Sitara. Raja says these Vishkanya are creating trouble for them day by day. Raaj Guru says he will soon find out about the intentions of these Vishkanya. 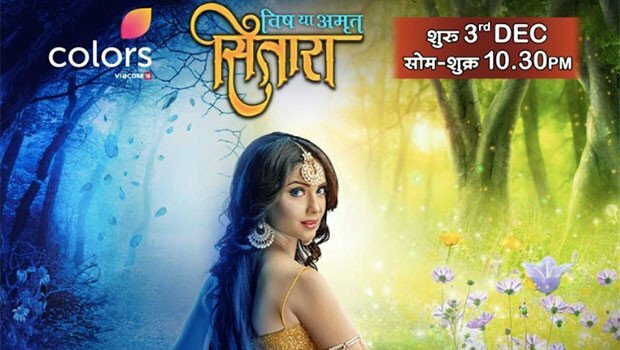 Sitara comes to Viraj. He was trying to break the thread on his arm. She tries to stop him as he is hurting himself. Viraj drags Sitara and pins her to a wall, he asks if she is happy about his and Nehtra’s wedding? Sitara gets away and says she is extremely happy and runs out of the room. Chabeeli as Nehtra hurries across the corridor with Raaj Guru’s blood. She thinks she must take it to Vrinda before anyone spots her. Sitara comes to the corridor. Thoughtfully, Chabeeli says I am sorry my child, then walks ahead. Sitara decides to follow her wondering why she called her as Child. Chabeeli reaches the door of Vishlock happily. Sitara comes from behind and finds the scar on her back ablaze. She then place a hand over her shoulder. Chabeeli stands up at once. Sitara says this means its Nehtra who has been occupied by that Vishkanya, she must be the one who hurt everyone. Chabeeli accepts being the Vishkanya and attempting all those attacks. She says she didn’t intend to kill anyone. She had to attack Choti Rani only to stop her. She needed Raaj Guru’s blood, displaying it in the bottle; that’s why she made the furnace fall. She explains that Vishkanya wants to get free from Vishlock. Sitara has always been misled about Vishkanya. She must accompany her to Vishlock and she will get all the replies for herself. Sitara wasn’t ready and asks how can she trust them? Chabeeli vows to all her powers and promises Sitara that every Vishkanya is ready to sacrifice their life to keep Sitara safe, she will even be allowed to return if she will wish so. But till she comes to Vishlock, she will never be able to understand their grievances, anger and concerns. Vrinda was emotional and tries to caress Sitara’s face. Sitara forbids her to touch her. She says every one of them is taking advantage of her weakness, they are away she has no mother and wants her to fell emotional. They wants to use her against the Raaj family. She can never be their daughter, they are Vishkanya and she is a human. Vrinda says Sitara is unaware of complete truth. Sitara says her Baba told her the truth, she can never be her mother and she doesn’t trust them at all. Sitara turns to leave. Everyone compels Vrinda to tell Sitara about her truth. Chabeeli says she brought Sitara here with much difficulty. Sitara had come to Nehtra’s unconscious body now. Vrinda thinks she is left with no choice. She loosens multiple snakes at Sitara. Sitara was terrified. Chabeeli heads to help her, Vrinda says if they wish Sitara to know her real strengths they must let this drama go on. Sitara had been encircled by a bunch of snakes. With a flash of lightening, Sitara swirls around and fights the snakes capturing her. Vrinda boasts this is the real face of her Sitara. Her powers are immense and holds excessive powers of a Vishkanya. PRECAP: Sitara wonders if she has lived a lie for past twenty years. Her mother was alive, still she was being lied. She hugs Vrinda.